OK, smart alec. I mean where specifically? Around the city centre of Glasgow. Should I give up now, or are you going to actually tell me what this is about? The M8 between junction 15 and junction 20 forms the northern and western flanks of Glasgow's never completed Inner Ring Road. 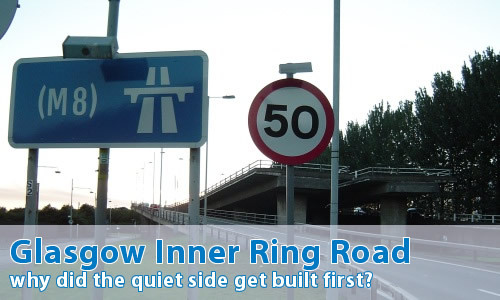 In fact, until the late 1990s, there was still signage proclaiming "M8 Ring Road". If you've never travelled on that section of motorway, then do so. It's completely mad! Exits left, exits right, entrances everywhere and the massive structure of the Kingston Bridge too. I did. The southern and eastern sides have never been built, although all the link roads are in place. At the north-eastern corner, the magnificent structure that is Townhead Interchange (J15) has a right-hand entry and exit pair, which feel really strange today, because it's just completely backwards. Simply because the main carriageway was never completed. The main route would have been continuous around the Inner Ring Road at that point, which is why the sliproads are so huge, and half hatched out. They weren't meant to be sliproads! You can really tell what's going on by following them. They suddenly coming to a crashing halt, and hit a set of off-set traffic lights. The eastern side of the IRR would have headed south near to Glasgow Cross, where it would have met the M74 coming in from the east. It would then have turned west, and headed straight for the other evidence of the missing plan: there's a pair of "ski-jump" roads stuck up in the air with no-where to go except straight through the buildings that they are pointing at! Great stuff. How would it have compared with the built side of the ring? Well, let's just say that the unbuilt side was expected to be the busier of the two sides! In places, it was planned to be six lanes wide, and the original planned route of the M74 would have had it meet the eastern side of the Inner Ring Road. Why was the quieter side built first? This section of the M8 is much derided for ploughing straight through the city centre, and causing untold destruction to people's homes and so on. This is, in fact, the received wisdom of why the other two sides were never completed. It's a great story, but it's false. Yes, it's not true. Well, that's not quite fair. There were some people moved out, obviously. However, the vast majority of the housing was due for slum clearance anyway, and this section was simply scheduled first to take adavantage of the fact. So, what about the planned M74 extension? Alas, this won't use the unused ski-jumps, but join the M8 slightly further west. OK, here's one created by Toby Speight, showing where the IRR would have been. How about some photos of the built section? Further to your description for this photo, the building is actually on a bridge, yup you heard me, a bridge! It's part of another of those wonderful 60s schemes. This one had the bright idea of getting traffic off Sauchiehall Street by running an elevated dual carriageway the full length and leaving a nice bright airy shopping precinct beneath. Proof, if any were needed, that there was some wacky stuff being smoked in the corridors of power. The bridge in question was constructed prior to everyone sobering up and was, in the true spirit of Glasgow bridges entirely unconnected to anything at it's finished level. Oh, technically it's a bridge is built on a bridge or are we calling that a tunnel at the Charing Cross? The law says that, unless signs indicate otherwise, there are certain classes of vehicle (HGVs being one example and cars towing any kind of trailer being another) that are not allowed to use the right-hand lane of a motorway carriageway unless there are only two lanes. When you have right-hand entrances and exits, it looks like you are supposed to assume that signs indicate otherwise. There have been other cases of one lane coming in to the right-hand lane. I wonder what the law actually says if you are towing through one of these sections." Good to see the M8's got some representation at last on the site, but I think you've missed something with a currently built section of it - one that's already pictured on the site too. It's the section you get to from junction 20 - the on-ramp next to the ski jumps. It's a motorway, but it's not the M8. According to the signs, it's just the (M8). Two lanes for its entire length, no hard shoulder, and it unceremoneously dumps you on the Clydeside Expressway, or on North Street, outside the Mitchell Library, because it's separated from the main motorway by a permanent metal barrier. It does, at least, take you across the Clyde. The best bit about it has to be the fact that they close it to traffic once a year and use it as part of the route for the Great Scottish Run, who use it in the wrong direction. I'm not sure if spectators are allowed up there too, but it must have a fantastic view! Regarding Martin's comments about the two lanes that take you across the line and dump you on the Clydeside Expressway. These lanes were only relatively recently permanently closed off with the metal barrier. All five lanes used to be open and you had people trying to get from the left most lane to lane four or five and others dtrying the opposite with still others trying to move to the lanes between. Rush hour was fun then. Ah the Glasgow inner ring road. As a child, I was always deeply fascinated and bemused by the sight of those truncated sliproads hanging suspended in the air over Charing Cross. They should be listed as works of Situationist Art. 1) In Ian Bank's novel "Espedair Street", the protagonist (an hermitic 70s rock star living near Charing Cross) goes out on the piss and ends a drunken evening hanging by his hands off the truncated slip-road and contemplating the traffic below. There's a couple of paragraphs extolling the existential nature of a slip-road to Nowhere. "Think what miracles this man will see in 20 years time....flying cars, unlimited energy; the ring road might even be finished!"